Are you ready for Friendship Day? In a little over a week, the United States will be celebrating National Friendship Day and this is a great time to think about the importance of friendship in the lives of our seniors. 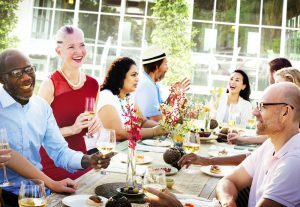 Having a group of friends to celebrate with and to share their experiences with on a regular basis can be extremely helpful for seniors. Having the support, care and devotion of friends can help seniors stay active and involved with those that care about them. As caregivers, we know the importance of regular contact with friends and loved ones and are proud to offer these tips from AARP for seniors who want to spend time with their friends. Get over the idea that everybody else your age already has all the friends they need. Finding new friends can help you share similar experiences that can enrich your lives and the lives of those that you meet! Check out continuing-education classes at your local college or university. In addition, many colleges allow older adults to audit regular classes for free, and some have programs specifically for seniors. If you’re retired, take a part-time job, even for just a few hours a week. It will expose you to new people and give you a little extra pocket money to boot! Volunteer in your community. Museums, hospitals, churches, animal shelters and schools are always looking for people to help out. Work out at a nearby gym or the Y — but don’t just do the machine routine: Join a class so you see the same people every week. No matter our age, it can sometimes be difficult to convince ourselves to try new things and meet new people, but the benefits that can be gained are certainly worth the effort. Regardless of what you may think the expectations are for having friends, finding ways to meet new people and enjoying the opportunity to share life experiences is a wonderful component of Friendship Day. The caregivers at FirstLight Home Care encourage seniors to take advantage of Friendship Day 2016 and to find a way to make a new friend during this celebration!